Does increased voluntary activation contribute to the greater improvements in strength after heavy load strength training? Do moderate and heavy loads produce similar increases in strength, lean body mass, and athletic performance in untrained females? Do motor neuron properties in the spine change after heavy strength training? Are the changes in circulating microRNAs different between heavy load, moderate load, and light load strength training workouts? Do powerlifters display different muscle microRNAs from untrained people? Can partial ROM ever produce greater hypertrophy than full ROM exercises? Do changes in muscle activation contribute to the joint angle-torque relationship? Which improves sprint times more: low-velocity or high-velocity leg curls? How does tendon stiffness influence strength and rate of force development? Do 1-leg and 2-leg jump training produce different improvements in 1-leg and 2-leg jumping performances? Is periodization optimal for improving maximum strength? What is the time course of muscle growth in the upper and lower body? Do drop sets produce greater gains in muscle size than standard multiple set strength training? Does light load training with BFR cause less central fatigue than heavy load training? Does strength training cause neural adaptations in synergist as well as agonist muscles? Which affects hamstrings muscle activation during running more: bodyweight or speed? Which muscle groups are associated with superior 100m sprint performance in track sprinters? 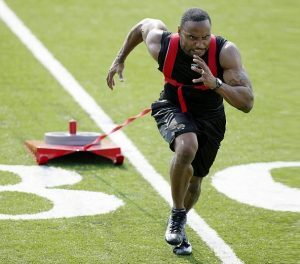 Can heavy sled towing potentiate subsequent short-distance sprint performance? Can a glute activation warm-up potentiate subsequent high pull force? Can plyometrics potentiate subsequent involuntary force production? Does knee angle affect the extent to which the plantar flexors can be potentiated? Does a looped elastic band around the thighs increase gluteus maximus activation during the back squat, without reducing repetition performance? How does muscle activation differ between the back squat and the belt squat? Are weighted jumps as effective as Olympic weightlifting derivatives for improving jump height in experienced athletes? How do bench press variations affect prime mover muscle activation? What are the central and peripheral mechanisms of the cross-education effect? How does visual feedback affect muscle activation during “cocontraction” strength training with no external load? Does light load training to failure cause recruitment of high-threshold motor units? What is the best way to measure voluntary activation? Could extracellular matrix stiffness affect muscle fiber shortening? Does protein supplementation increase muscle mass in healthy adults? Can BCAAs increase post-workout muscle protein synthesis by as much as whey protein? Can an amino acid electrolyte drink during exercise improve post-workout recovery? Does pre-workout caffeine increase both upper and lower body maximum strength and repetition strength? Can omega-3 fatty acids supplementation alter mitochondrial function and improve post-workout muscle protein synthesis? Do maximal fat oxidation rates differ between those individuals who have successfully maintained lost weight, and those who have not? How do the elements of the energy balance equation affect each other in caloric restriction? Does exercising reduce non-exercise physical activity? Is anabolic steroid usage associated with an increased risk of cardiovascular disease? Does externally-administered growth hormone increase lean body mass? Does long-term stretching improve muscle force production? Does a history of hamstring strain injury affect changes in biceps femoris muscle fascicle length over an Australian Rules football season? Does Nordic hamstring curl strength training improve sit-and-reach flexibility? Does gluteus maximus contraction velocity improve after arthroscopic treatment of FAI? Can hip muscle exercises reduce dynamic knee valgus in ACL repair patients? Does the force used when foam rolling affect improvements in flexibility? Does foam rolling of the foot produce non-local changes in flexibility? Can foam rolling increase lactate clearance and improve running performance in subsequent efforts? Does manual therapy produce pain-relieving effects by a placebo mechanism?